The new TL400B Smart Lock lets your smartphone become your key. ZKTeco’s smart lock provides various access methods, including fingerprint authentication, password, smart card, key and smartphone. For smartphone access, a dedicated app can be downloaded to manage and unlock the TL400B. It allows you to unlock the door with your smartphone, send unique visitor access codes from your phone, include a time table which allows you to select the day(s) and time table(s) you would like to provide guest access to your lock. Using BLE 4.0 means less power consumption and longer battery life. • Various access mechanisms – fingerprint/password/card/key/smartphone. 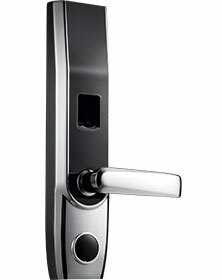 • European standard mortise – the door locks by itself once closed. • Enhanced security via random password for code access. • Idle handle design to prevent forcible entry. • Voice guide for easier and more convenient use. • Voice volume is adjustable. • Smart alarm for low battery and illegal operation.